Mother Neff offers grassland, bottomland and forest, all in one place. ﻿﻿﻿﻿﻿﻿﻿﻿﻿In three hours of walking around Mother Neff State Park, a visitor can experience three different ecosystems. The bottomland on the Leon River is shaded by huge trees. Pecans and bur oaks with trunks bigger than a potbellied stove mingle with hackberries and cedar elms to form a green canopy high overhead. These trees have survived droughts and floods. Some were here when Texas Gov. Pat Neff was a boy, when this riverbank was his family’s own gathering place. Isabella “Mother” Neff donated six acres to the state in 1916. Serving as governor from 1921–25, her son led the effort to establish a state park system and gave additional land to round out his mother’s namesake park, Texas’ first official state park. The acquisition of an additional 142 acres, including a half-mile of Leon River frontage, was authorized in May, adding to the park’s existing 259 acres. The Lost Trail leaves the river bottom and ascends the limestone escarpment, winding through an oak and juniper forest marked by interesting rock formations and intermittent streams. Understory trees such as Mexican plum, Texas persimmon, possumhaw and rough-leafed dogwood provide spring flowers, fall color and food for wildlife. Vines encircle trunks, and woodland wildflowers find homes in the dappled shade. Good rest stops include the Cave, a natural rock shelter that was used by Native Americans, and the Wash Pond, a serene woodland pool fed by water from a nearby spring and runoff from the high ground above. 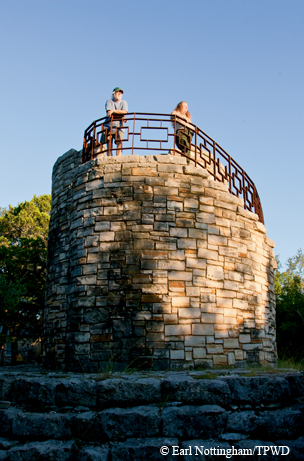 A side trail leads to the park’s old stone water tower. Like most other park structures, this was built by the Civilian Conservation Corps in the 1930s. An iron stairway spirals to the top for a treetop view of the forest. A network of trails on the high side of the escarpment crisscrosses a restored mid-grass prairie, dotted here and there with leftover juniper trees. This breezy expanse of land is a community of wildflowers in spring, a sea of ripening grasses in late summer. It’s not a difficult walk. Much of it is in the shade, and the elevation change is less than 200 feet. 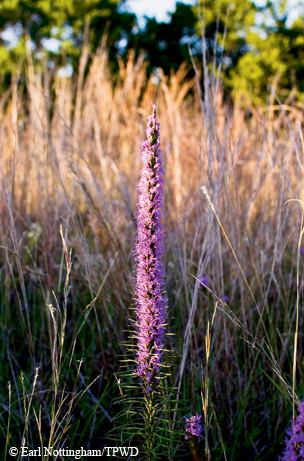 Strolling Mother Neff’s woods and prairies, it’s easy to forget the park is just an hour from Waco, a mere 16 miles west of the unending traffic on Interstate 35. Mother Neff State Park is located 7.7 miles west of Moody off FM 107. Take Texas Highway 236 for 1.3 miles to the park. For information, call 254-853-2389 or visit www.tpwd.state.tx.us/motherneff.